This past week I linked up with Blog Hoppin' for Teacher Week 2016. Well, this week was my second week in school and a busy, yet great one at that! The beginning of the school year is such a whirlwind, and I loved the simple format and it was super easy to post on Instagram every day. What's there to tell? The above picture summarizes me pretty well. I tend to stick to the basics and love what I'm doing wholeheartedly. I am truly a small-town girl and have these Sierra Nevada mountains in my blood. I went to a small K-8th-grade school. a relatively small high school, and our local community college. This community is my home. I attended UC Davis and am a Geo-Aggie through and through (Geology major if you didn't know that). Most days you can find a stack of Amazon Prime orders stacked on my doorstep, and I always have two wiggling rescue pitty pups waiting for me after school. I'm addicted to Nickel & Suede earrings and like to play with color in my fashion. Most importantly, I have been married to a wonderful man (and the BEST #teacherhusband) for nearly eight years (our anniversary is 11/17). Christopher is quite the amazing support and is my backbone and the reason why I can follow my passions so fully. 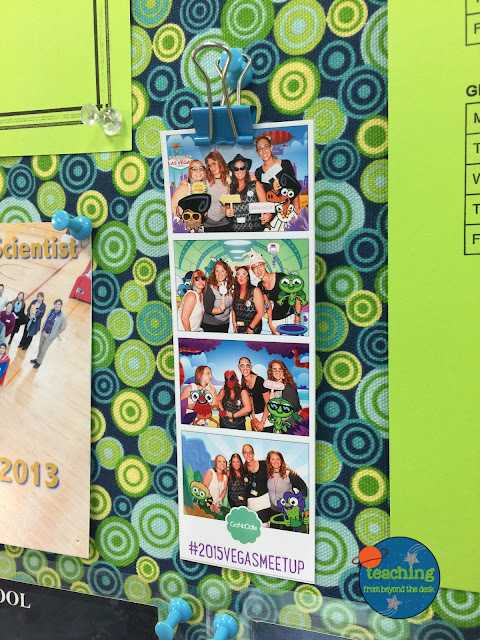 My teaching passions are rooted heavily in math and science. I have participated in the Salmonids in the Classroom project for three years and have been successful all three years. Only one salmon egg has not successfully made it to the river (89/90? I'll count that as SUCCESS!). As I have transitioned from 5th to 6th and a 4/5th classroom the focus of this unit has shifted, but every time it has been such an engaging experience. Our Chinook salmon have led discussions about the environmental impact of human development, river stewardship, and the drought in California. We have talked about the effects of dams on our local rivers, the loss of the natural salmon run due to changes to the river (focus on our local Tuolumne River) , and historical influence of the salmon run on populations of Me-Wuk Indians. Each year my lessons change and evolve. They always surprise me. Running the whole program is exhausting; however, each December when I set up my tank I get reinvigorated. 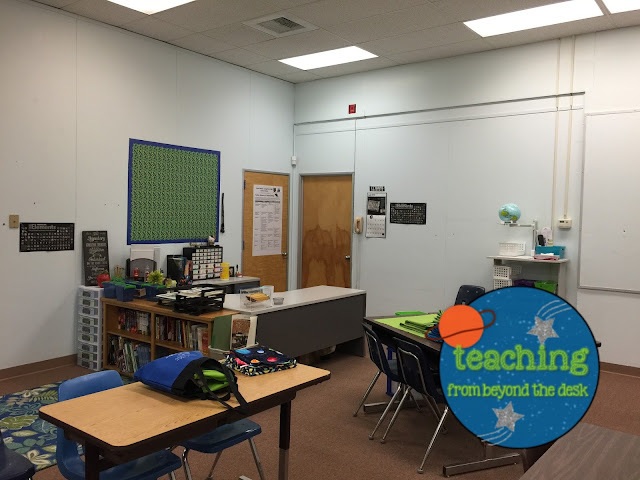 My classroom is my home away from home. The room was the former library for many years, so it has taken a lot of effort to make it feel like a classroom again. This is the second year that I've been in this room and hopefully many more! 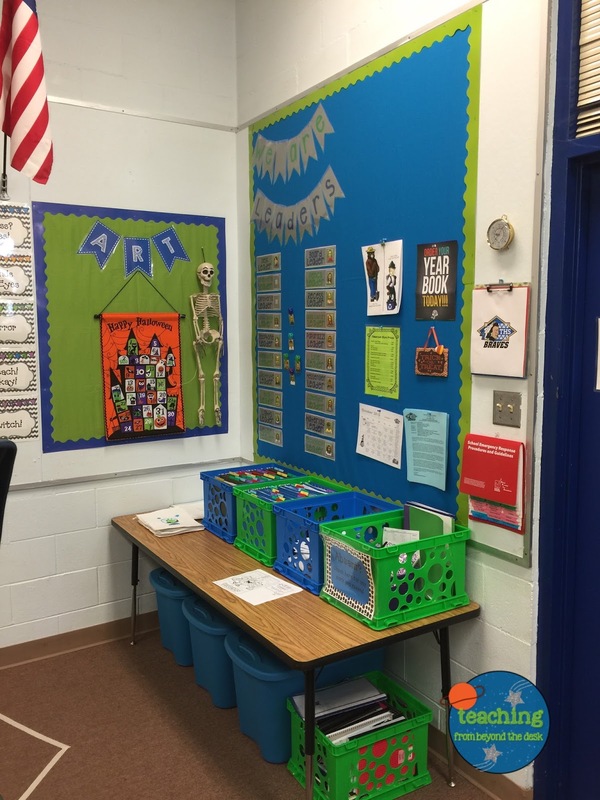 My room is colorful and bright and focuses on making this a space students love. They take ownership and pride in our room. After all, it is OUR room. I haven't completed a complete reveal of my classroom, so consider this a sneak peek! If you have spent any time on my Instagram page, you know that I love to dress up for the classroom. 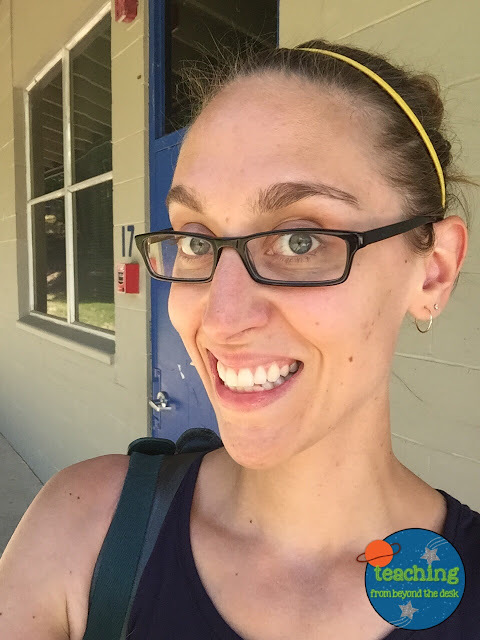 Over the years I have been known to dress to match my lessons and have been nicknamed "Ms. Frizzle" at my school site. Rocket ships, dinosaurs, numbers and salmon eggs are just a few things that I have incorporated into my outfits. Fashion should be fun and my daily outfits make sure that I have a blast with my students. If I cannot bust a move with Koo Koo Kangaroo, lay on the floor with a whiteboard, get messy with glitter and paint, then I won't be wearing it in the classroom. Now, don't confuse that with a casual flair, I make sure I still look professional and I love to feel fancy in my clothes. It is really a balancing act. Over the past three years, I have been teaching (five if you include my student teaching time), I have learned how important relationships with your colleagues are to your happiness. I have been blessed to work with such wonderful people and have expanded my group of teacher friends with the help of social media. While these are not ALL of my teacher friends or supports that I have, these are the standouts (and ones I actually had pictures with!). Laura: We LOVE technology! Together we have been nicknamed: "The Laura's" (or Laura Squared). I am so thankful that we can chat and collaborate with the STEM TRACKS program or in our masters classes. Laura & I teach at neighboring schools and have both been in 4/5 combo classes recently. It seems like the more time we have together, the more powerful our collaboration time becomes. 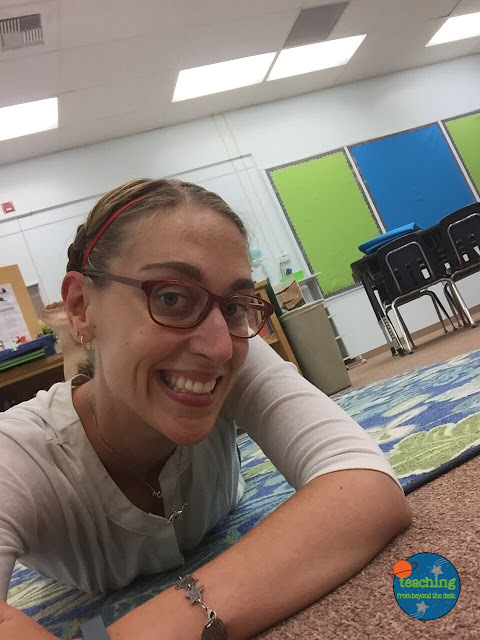 Bobbie: I absolutely love following Bobbie's ideas on her Instagram page (@super_mrsk). She is a fellow CalState TEACHER and I am thankful that we got to meet during our #TeachersTakeSacramento2016 meet up. Amy: TPT's Director of Seller Happiness is a bundle of ENERGY! She is such a positive cheerleader for teachers and education. Within minutes of meeting her at #TeachersTakeSacramento2016 , I knew that she would be a positive force in my life. I am so thankful for her. Becky: My mentor teacher AND my BTSA support provider, a colleague, AND friend! This lady is such a support in my life and I could not imagine a world without her. Ironically, Becky had my great-grandmother as a teacher and my husband was in Becky's mother's class in first grade. He also had her as a student teacher several years later. As I am still learning about the world of teaching, Becky continues to be my source of support. I continue to be her text/call away technology support! The CAFAB4 meets Team TPT: What an explosion of innovation all in one picture! I cannot say enough about each one of these people. Team TPT (Amy, Elliot, and Jillian) are a fantastic bunch! They bring love and support for education wherever they go, and have really pushed me to keep being the educator I know is possible. 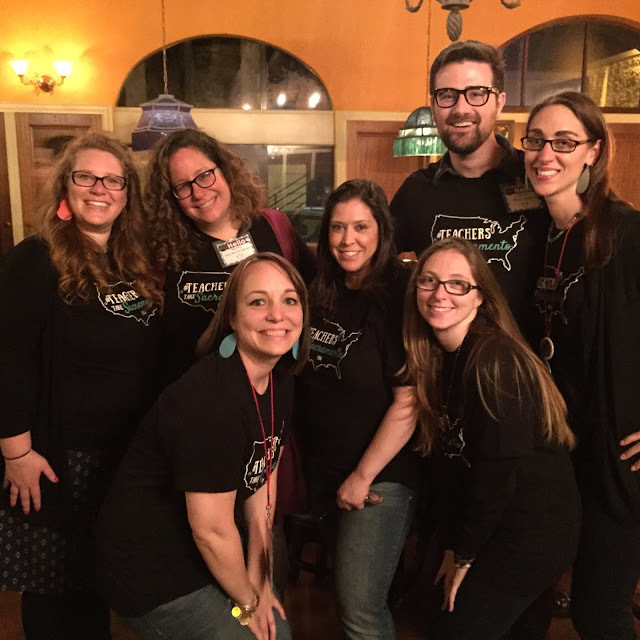 I was so excited to meet them at our first annual #TeachersTake meet up. I am hoping that they can come to our 2017 meetup (planning is in the works). The ladies of the CAFAB4 (Brianne, Erin & Sarah) are my an integral part of my found tribe. I know that whatever is happening, these ladies will be the positive cheerleaders, a source of ideas and overall happiness I need. We have become quick friends, and I know all of them will be in my life for the long haul. If I ever need a pick-me-up I just call/text/Vox and someone is there. I LOVE it! The "Dark Side" Team: Wow! What would I do without these people? (Larry, Cynthia, Debbie, Lindsey--not pictured Janet). We have almost TOO much fun at school. Laughter can always be heard from our side of the building, but I know that lots of learning is happening too. We like to pick on Larry, decorate for the seasons, and most of all just be there for each other when we need it. I don't think anyone on our side of the building takes ourselves too seriously. It is a wonderful place to work. I'm so excited to be part of this team and am happy to welcome Nancy & Gabby this year! 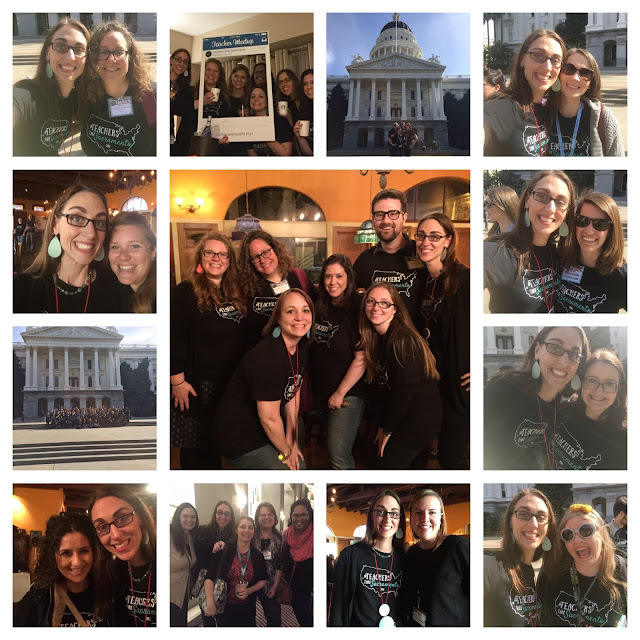 Katie Byrd: I am so thankful to meet the positive and always bubbly Katie (@mrsbyrdslearningtree) at our #TeachersTakeSacramento2016 meet up! I always felt pulled to her Instagram account, and I absolutely love her energy. She has been a cheerleader for me on my social media account for awhile, and I am always so happy when she likes or comments on my posts. It is funny how you can feel so connected through social media, but Katie is one of my Instagram teacher friends. I'm hoping we get to chat more at our next meet up! Sheila Jane: I know that this FABULOUS lady knows how much I adore her. Sheila has been a sparkling beam of joy in my teaching life for the past two years. I finally had the opportunity to visit this beauty at her house this summer (though we did briefly chat at the #TeachersTakeSacramento2016 meet up) , and I know that her positive energy will continue to carry me through my teaching career. When I need to refocus my energy in teaching or really return to my roots/love of education, I turn to Sheila. 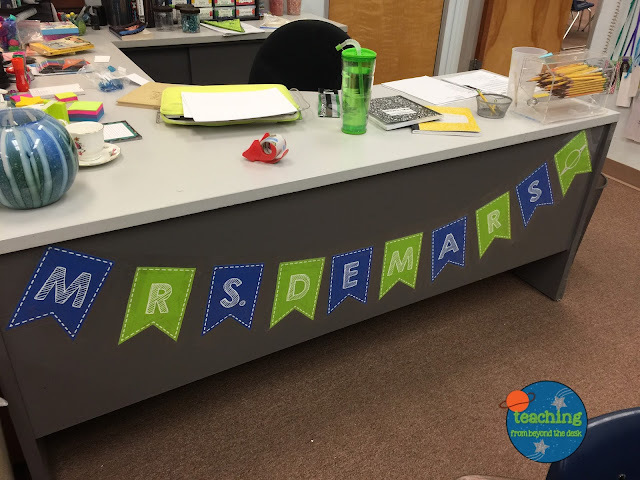 Her calm nature and support for the happiness of teachers is phenomenal. Thank you for reading through my crazy highlights of the week! I hope you all have a wonderful 2016-2017 school year! Stay tuned for a tour of my classroom this year and the exciting news I've been dying to share! When I joined the four-person planning team and we started planning this event, I was not quite sure what to expect. I know personally that meet ups have been enriching experiences that have allowed me to bond with other teachers, share stories, and form relationships with people across regions, states, and country borders. 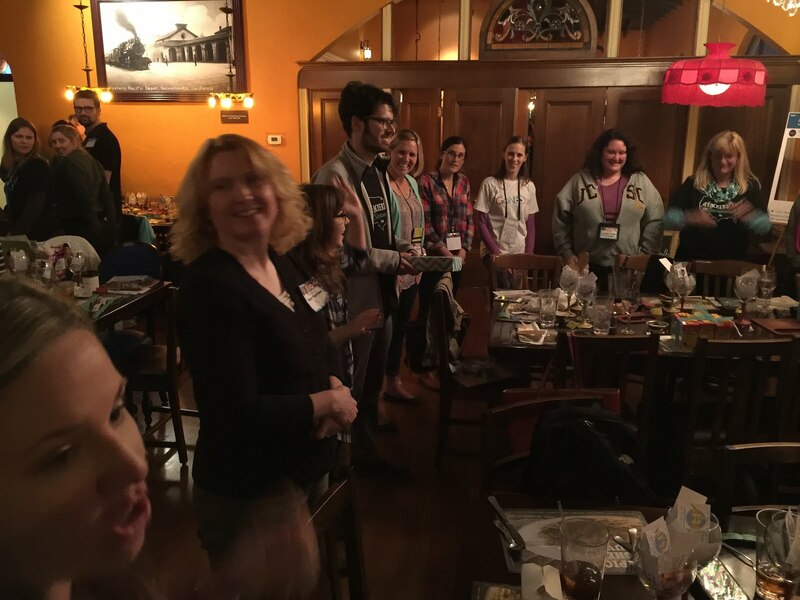 It was my hope that through this meet up that it would allow teachers the opportunity to connect with each other. 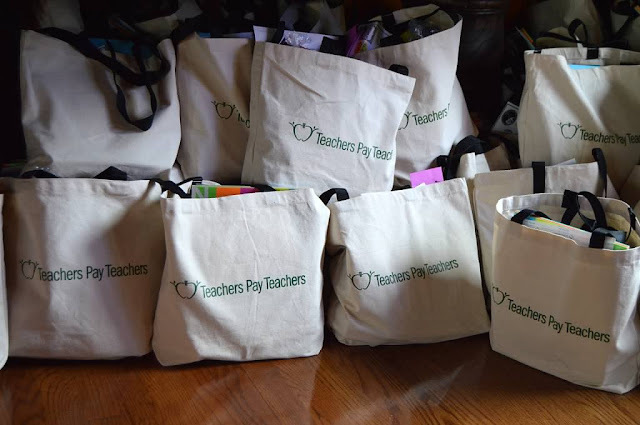 I know that for me teaching can be isolating and meet-ups have allowed me to build relationships with Teachers Pay Teachers sellers, share common issues and struggles with other teachers, and build friendships with other people in the realm of education. In fact, Brianne, Erin, Sarah and I have become friends and been able to bond due to previous meet-ups we have attended. 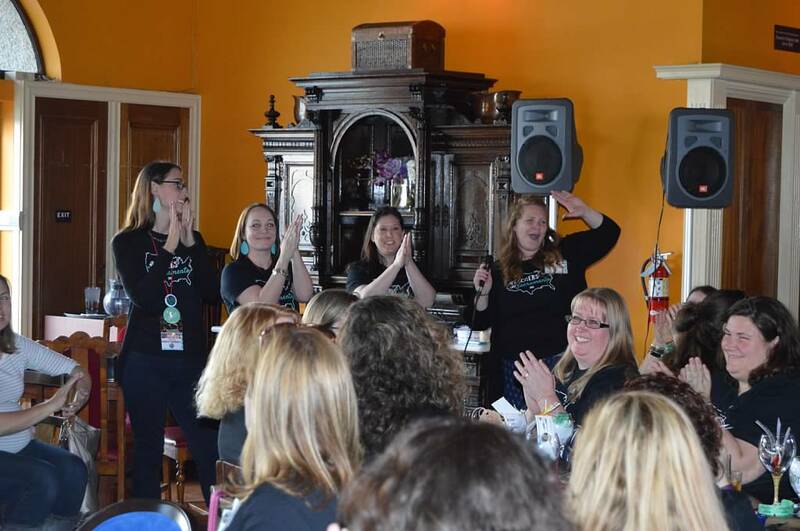 It is through previous meet-up opportunities (including time spent together at TPT Vegas 2015) that we have been able to form valuable friendships. I know that I have leaned on each of them for support, we bounce ideas off of each other frequently and share in the general struggle and laughter that comes with teaching. They have quickly become an integral part of my teaching tribe all thanks to previous teaching meetups and gatherings. 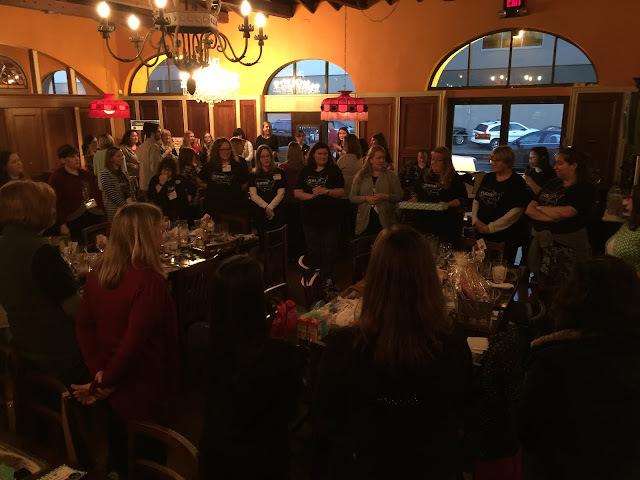 As we began planning this event I knew that if it provided the opportunity for just one person to make a connection with another educator, then I knew it would be successful. As anyone that has planned an event (big or small) would know, sometimes the details can drive you crazy. Through our late night Voxer messages, lots of emails and text messages, and conversations over meals Teachers Take Sacramento 2016 more than a crazy idea or dream, it became a reality. Throughout this process, I learned that working as a collaborative team can be such a rewarding and empowering experience. I learned that while Brianne enjoyed coordinating details with the location coordinator, attention to detail and decorative flair was truly Sarah's forte. Erin, on the other hand, was phenomenal at gaining outside educator (including that AMAZING dropbox link) and TPT support, and she was the head contact which ultimately was responsible for getting team TPT to our event. I am grateful for being able to work on such a memorable event and could not ask for better friends to share the experiences. Our weekend of adventures started with a low-key gathering for drinks with friends and ended with even more time for talking and laughter. Each moment will be treasured and I am beyond blessed for each one of the unique and passionate education-enthusiasts I met throughout the weekend. Each and every person brought their passion and love for all things teaching and I left feeling inspired knowing that these wonderful human beings are making a difference in the lives of so many people. 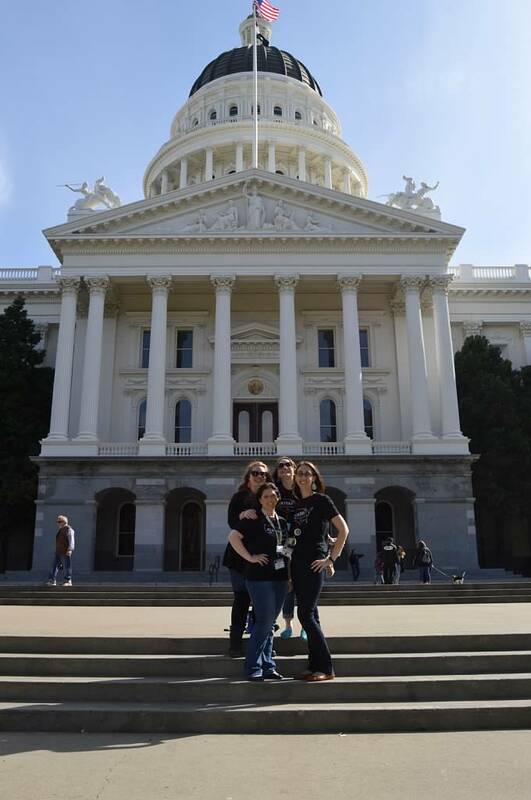 #TeachersTakeSacramento2016: Outside the California State Capitol Building in our fabulous shirts printed by Graphic Traffic by Marty (a local business here in the CA Bay Area). During the planning process, Sacramento always seemed like an obvious location choice. Full of rich history and fabulous eateries, when we finally decided on a location I instantly started dreaming of fun activities. As a former Sacramento resident (I attended UC Davis--GO AGS! ), I spent a lot of time wandering the Downtown and Old Town Sacramento area. 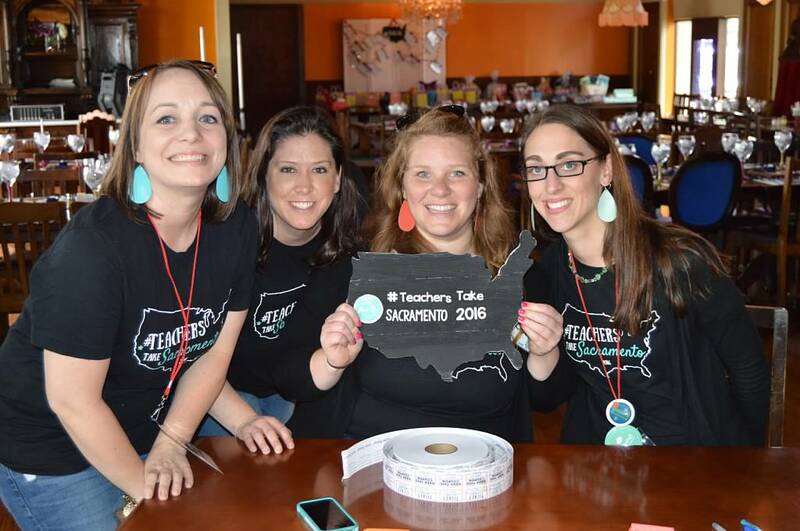 After narrowing down a list of ten places, the Teachers Take Sacramento 2016 Scavenger Hunt was born! While I'm still slightly envious of all the bonding time during the scavenger hunt, I can honestly say that I had a blast watching all the photos take over my social media feed. Some of my favorite photos from the Teachers Take Sacramento 2016 Scavenger Hunt. 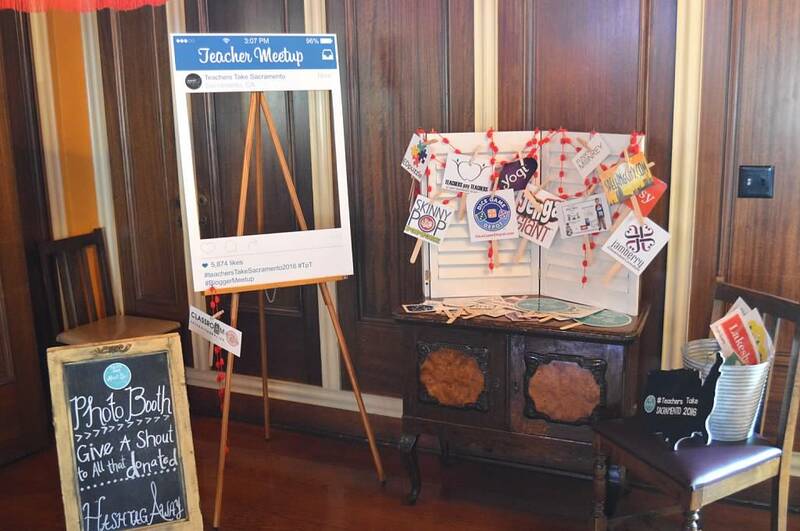 One of my favorite parts of this event was watching our hashtag fill my Instagram and Facebook newsfeeds. What I loved the most was seeing teachers creative, sometimes a bit goofy, and enjoy getting to know each other. Who doesn't love a photo booth?! What I love the most about this adorable prop made by the Photo Booth Prop Shop on Esty is the nod back to social media (Instagram). While mingling and maneuvering between groups of people, I overheard, "I follow you on Instagram!" so many times. It goes to show how powerful social media can be in the teaching community. The laughter was definitely contagious over on this side of the room! Something that blew me away (as a first-time event organizer) was the generosity of all the companies that sponsored. We had the support of companies big and small and overwhelmingly we heard the words, "Yes! We love teachers!" 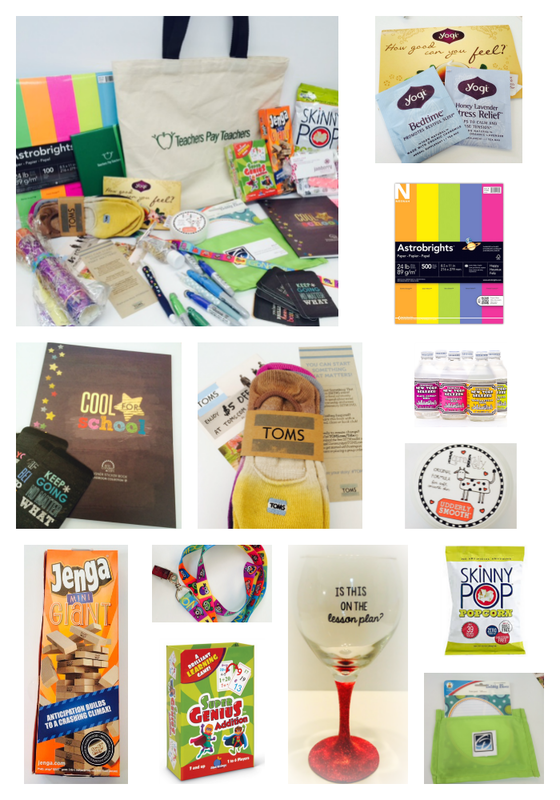 We were blessed to have so many different companies and small businesses donate digital and customized products. Sarah had the great idea of displaying all their donated products in such an elegant manner. Seriously, if you need inspiration for party planning, crafty solutions, or decorations, Sarah is your girl! Thank you Spelling City, Planbook, Alexis from Laugh Eat Learn Designs, Tailwind for your generous support!!! Brianne had the great idea of making one of our giveaways an interactive game. Throughout the reading of a story written celebrating our meet-up participants passed a special gift either to the left, right or across the circle. After many giggles and attempts to remember which way was which, three lucky winners finally got to unveil their prize. 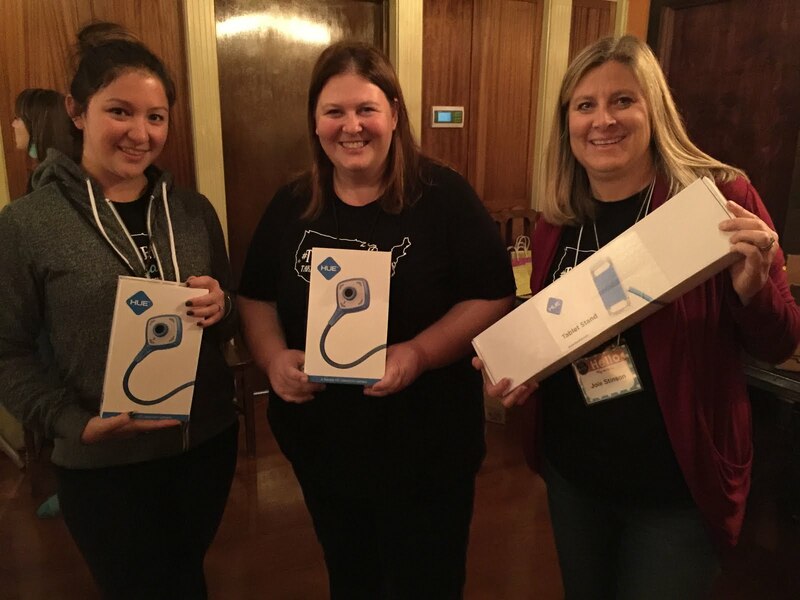 Thank you to HUE HD for donating such wonderful technology goodies. 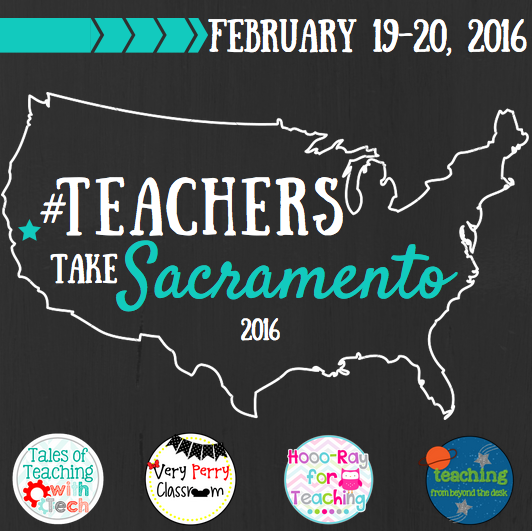 Many thanks to Amy, Jillian, and Elliot of Team TPT for supporting and attending Teachers Take Sacramento 2016! 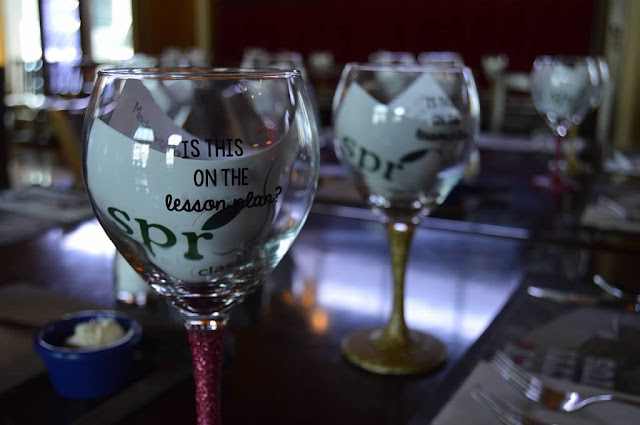 A HUGE shout out to Kat of Sprout Classrooms for handmaking a beautiful wine glass for each one of the attendees. As we were setting them out on the table, I could not help but notice how beauty they brought to our meetup. In the times that I have used my glass since the meet up I cannot help but smile and remember the laughter and joy that accompanied the weekend. It goes without saying that yes, laughter and camaraderie (with wine, of course) is always part of the plan. A special thank you to Sheila Jane for her continued support and promotion of teacher happiness. What could bring more teacher happiness than delectable, bite-size treats!? Thank for donating edible happiness and continually being a ray of sunshine in the teaching world. Congratulations on celebrating your one-year birthday of www.SheilaJaneTeaching.com. It makes me so proud to be part of THM network! Oh boy! Bowling with teachers is a real treat! We don't mind being a little bit goofy and we don't take ourselves too seriously! It was such a blast to end a fantastic evening with such a laid-back after party. The smiles of this weekend will forever be kept in my heart. The level of passion and love for all things education brought light to my heart and a renewed sense of love for the teacher community. One of the biggest joys of this event was seeing the passion, inspiration and love that people have for teaching (and all things related to the education of children). My deepest thanks to all our wonderful sponsors and everyone that made this event possible. I am forever grateful for the time that was shared celebrating. And of course, we could not leave you out of our meet up! Join in on the fun & enter to win a swag bag! As we near the hustle and bustle of the impending holiday season, it is important to take a moment to appreciate the little things. I know for me that November is a time to reflect and show my gratitude for those people that are important in both my professional and personal life. All too often, I feel we do not take the time to reflect on the details that are all too important, and it has been my goal this November to allow all students (and me) the opportunity to reflect on things we are grateful for and the ability to express these feelings. Throughout the month, I embedded lessons and activities that allowed us to not only get to know the people in the classroom as individuals but allowed for time to reflect on those little things that ultimately mean a lot. In my classroom, I have two different whiteboards--one features a daily quote, and the other has a daily fun fact (inspired by Sarah at Tales with Teaching with Tech). Starting in November, the focus for our quotes shifted to gratitude (one of my favorites being the one above by Johannes Gaertner). The placement of these boards in my room is something that I thought a lot about because I wanted them to be a functional point of interest. Our "Did you know...?" board is placed directly on top of our iPad cart because it provides students an opportunity to see the question and discuss the fun fact while they check out their iPad from our technology leader. I had originally put this board in another location; however, I have noticed since placing this board in another location it has made it a focal point in our classroom and my students are frequently discussing the topic--rather than it going unnoticed. While these facts are more points of discussion, during the month of November, our month of gratefulness, I use the facts surrounding Thanksgiving to round out our thematic approach to the month. During our writing time, students spent 10 minutes responding to the daily fact in their journals. 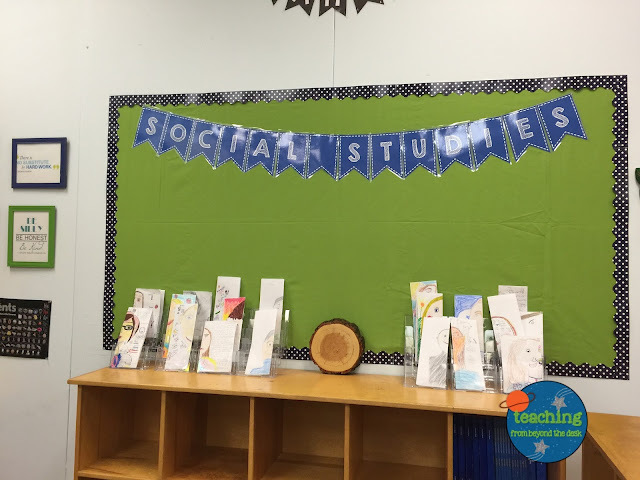 Students were able to express their excitement, questions it spurred, or just their thoughts. I found that this often led to continued discussion, research about our own culture, or a launching point for curious discovery between students more so than previous months. While I compiled a list of Thanksgiving-themed "Did you know...?" facts from a variety of places, my favorite place is from the Lunchbox Love Notes Holiday Edition cards (you can pick them up from Amazon here). I couldn't resist talking about pie on our "Did you Know..?" board because it is a running joke in math that I always use pie in my application problem examples. Sometimes it is important to keep those running jokes alive to continue to foster a positive classroom community. Our quote board is placed directly next to our door. It is one of the last things my students see as they leave our classroom. 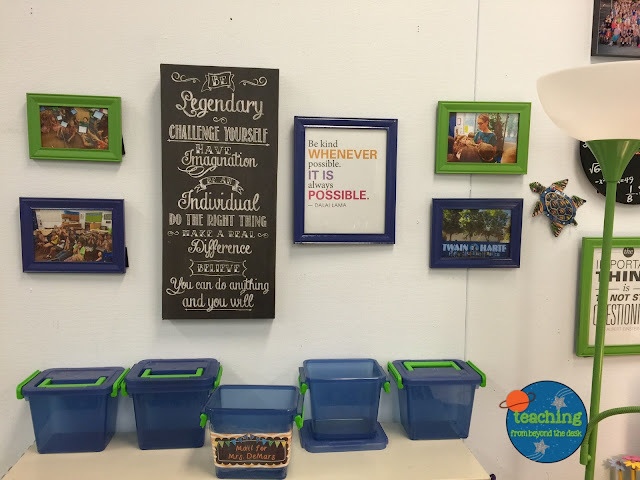 Every time we leave or enter our classroom, I make a point to greet my students. We start our day with handshakes, leave for lunch with high-fives (we jokingly call them "free high-fives because my students can purchase additional high-fives with our classroom monetary system), or we might shake things up with fist bumps. While students are waiting to leave, I have caught my students reading our quote board. While I initially started using this board for reminders, I switched the purpose of the board this month. 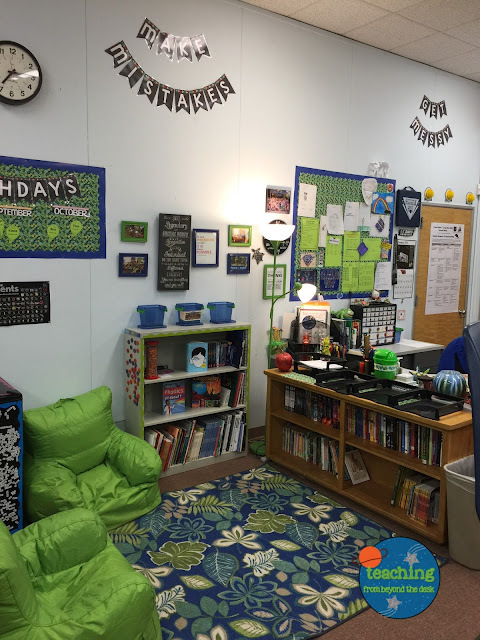 My main reason for switching this is that I wanted it to be more meaningful for my students--this is their classroom after all! After the success I've witnessed this month, I am going to continue to use this board for quotes. Does anyone have any ideas for a theme for December? During the first week of November, I started putting up quotes without really discussing them or saying anything and then something happened--I forgot to write the quote one morning. While doing our daily attendance question, (If you want to learn more about this routine let me know. 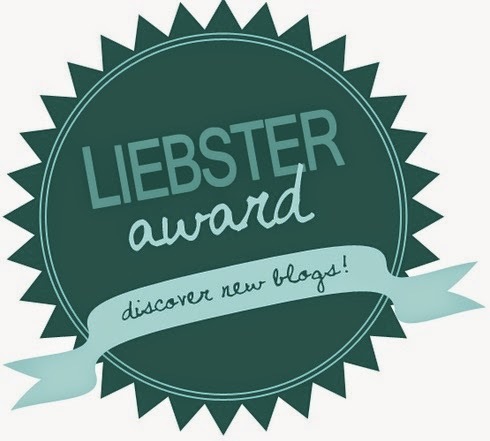 I've been toying with the idea of writing a post!) one of my students quickly reminded me that I hadn't written the quote. To be honest, I was floored! Without noticing, I had created another routine. I then had several other students quickly chime in that they missed our daily quote. So, as you could imagine, I spent the next few minutes writing our daily quote. (In case you were curious, it was this one: "Let us be grateful to people who make us happy--they are charming gardeners who make our souls blossom"~Marcel Proust). As I was writing, one of my students was confused about the phrase "souls blossom", so our whole class spent a few minutes jotting down our thoughts (in a Me vs. You chart) and then having a conversation about our quote. 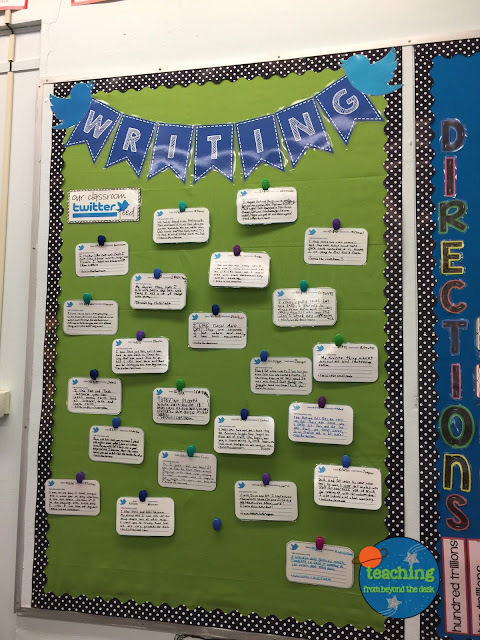 This process was completely organic in its formation, and my students and I found it so valuable, that we ended up doing this for nearly every quote. Now I bring you to our two events today: Our Thankfulness Feast and the Circle of Gratitude. As I sat down to reflect about these past months (AKA: Report Card Time), I really began to think about how much these students have captured my heart and how little time I have spent thanking them for being at school. This is when I decided that I wanted to end November--that being a small gesture of kindness from me to them. As I brainstormed ideas, I decided that cooking a meal would be something that would be appreciated and a simple act of gratitude. This morning I started a tradition that I will likely continue throughout my teaching career--the Thankfulness Feast. As my students participated in a few Thanksgiving-themed activities, I served them pumpkin pancakes. This gave me the opportunity to express my gratitude for them individually. We all just took a moment, looked at each other, and were able to connect in such a meaningful way. I get chills about how powerful this was today. We ended the day with something that, to be honest, was spur of the moment, and I'm glad that I tried it--the Circle of Gratitude. The concept is simple, sit in a circle and express your gratitude. Prior to coming together, I had students reflect for 5 minutes on things that they were grateful for and why. The level of thought and explanation surpassed my expectations. When we came together, students were engaged, supportive, and genuinely kind to each other. They shared gratefulness for eachother, their family, pets, the fact that I graded their math tests on time (ha! ), and a variety of other things.The most surprising response that I heard today was from a student that has had difficulty making friends with other students this year. They said, "I am thankful for all the students in this class because they have helped me feel comfortable being myself." This comment made me tear up and resulted in many hugs being shared in the classroom. I would wholeheartedly recommend trying this in your classroom. My student's answers were so touching and just helped solidify the connections we've made in our classroom this year. 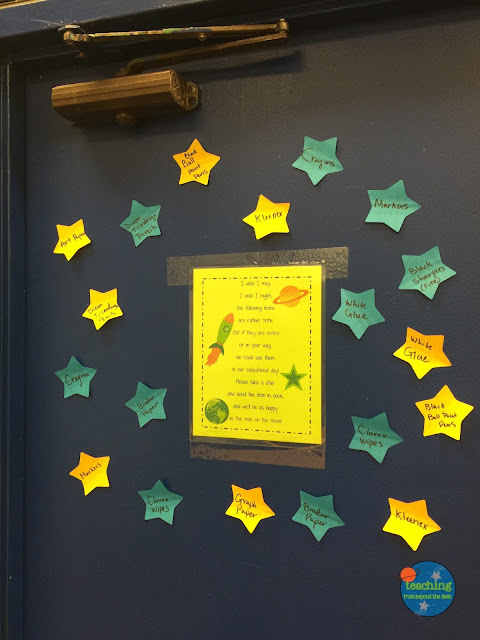 While many of these activities were formed organically in the classroom, my efforts to focus on gratitude in November were intentional. I have learned how powerful words, or simply taking the time to acknowledge gratitude can be on the atmosphere of the classroom. I hope everyone takes a moment to share their own feelings of gratitude and love those around them and know that no matter how small, everyone wants to be loved and know that they matter. I would love to hear how you express your gratitude in the classroom (or otherwise). Let me know! Happy Thanksgiving & Happy Learning! OUR MEETUP IS OFFICIALLY SOLD OUT!!! It's HAPPENING! The Pacific Coast Region Meet Up is ACTUALLY HAPPENING!!!! I feel like it was SO long ago that we started kicking around the idea of a HUGE meet up...and here I am sharing it with all of you! The weekend we have planned is filled with fun and collaboration opportunities!! 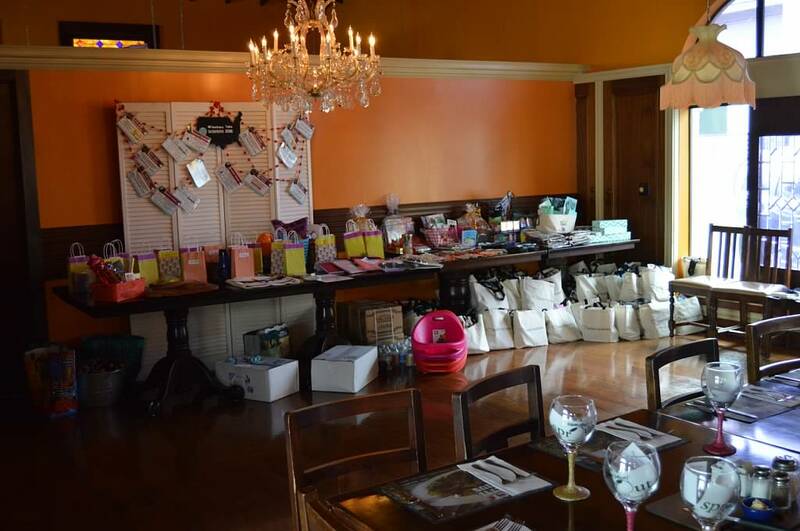 We have AMAZING giveaways and an awesome SWAG bag for all of those in attendance! Space is limited! 3. Book your hotel! :) We recommend somewhere in Downtown or Old Town Sacramento! 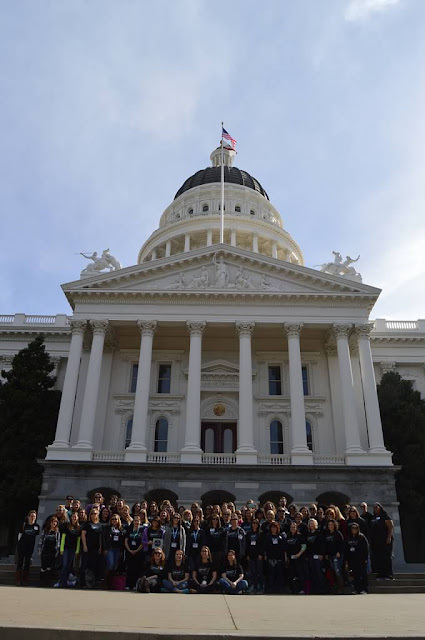 All of our activities will be held in or near the capital and Old Town Sacramento. 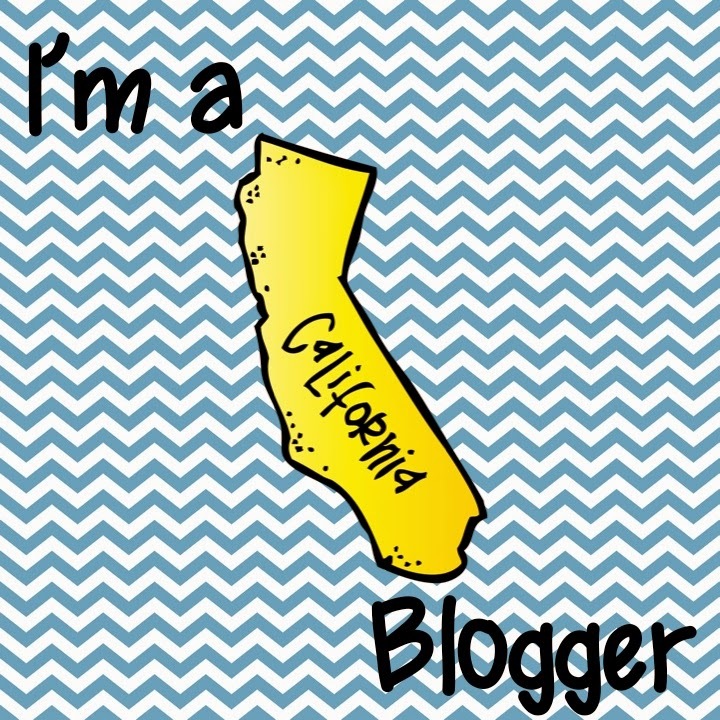 If you need suggestions, I used to live in Sacramento! Well, here we are over eight weeks into school, and I have yet to do my classroom reveal post. As I reflect about the craziness that has occurred during these past two months, I realize that it is okay. My classroom is finally starting to come together, and there are less empty spaces on the walls. This was a major feat that has been quite the challenge this school year. 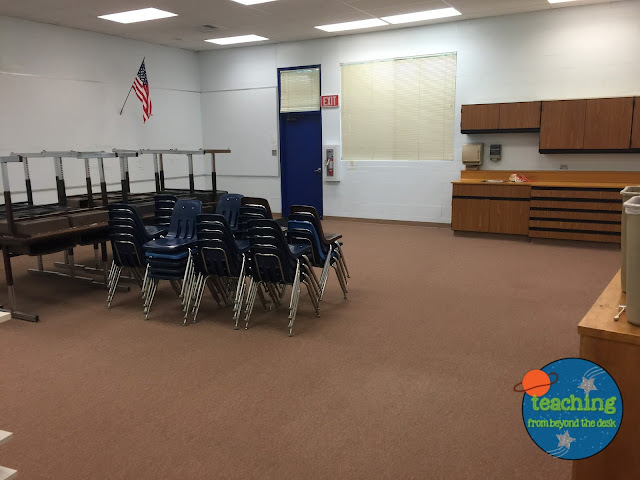 While I received the keys to my classroom relatively early in the summer, most of my furniture and essential pieces to my classroom did not arrive until right before (or after) school started. It made organizing and decorating that much more of a challenge. If you have been following my teaching journey, you would know that I switched schools/districts and grade levels this school year. After a long debate, I decided to take a teaching position closer to home. This decision is something that was not taken lightly, but I am elated that I did decide to make the switch. While this process could be a bit nerve-wracking, I returned to the school that I student taught at, and it has felt more like coming back home than a new school. One of my mentor teachers is on campus (the other retired) and so many familiar faces are in the classrooms surrounding mine. It really has been a wonderful homecoming. Best yet? The students I am working with are those that I worked with as a student teacher and/or long-term substitute. This move was really about coming full circle. It is extraordinary. Back to my classroom process. 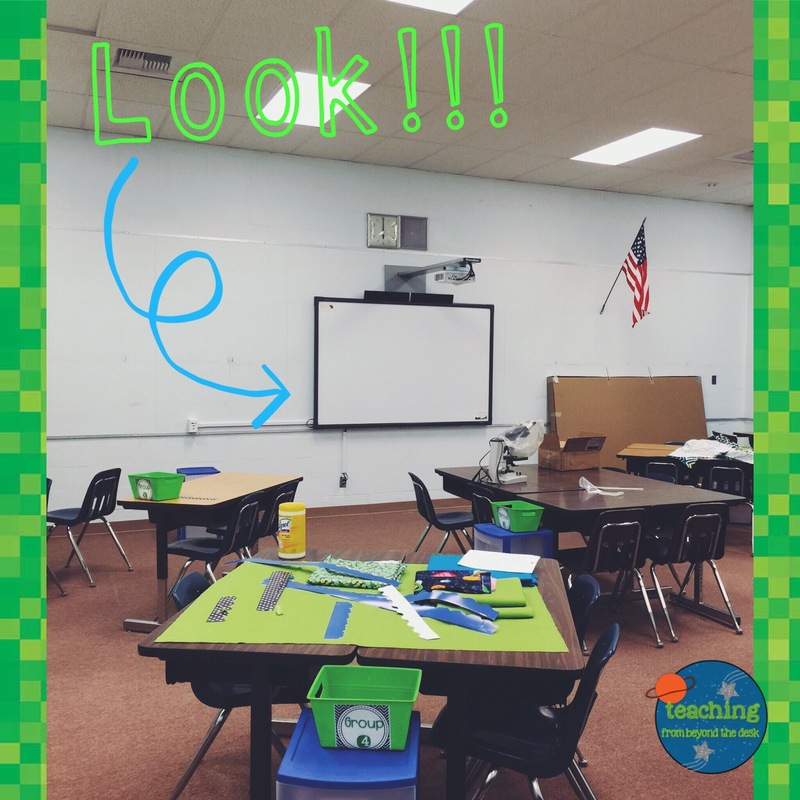 I received my classroom keys on June 29th. 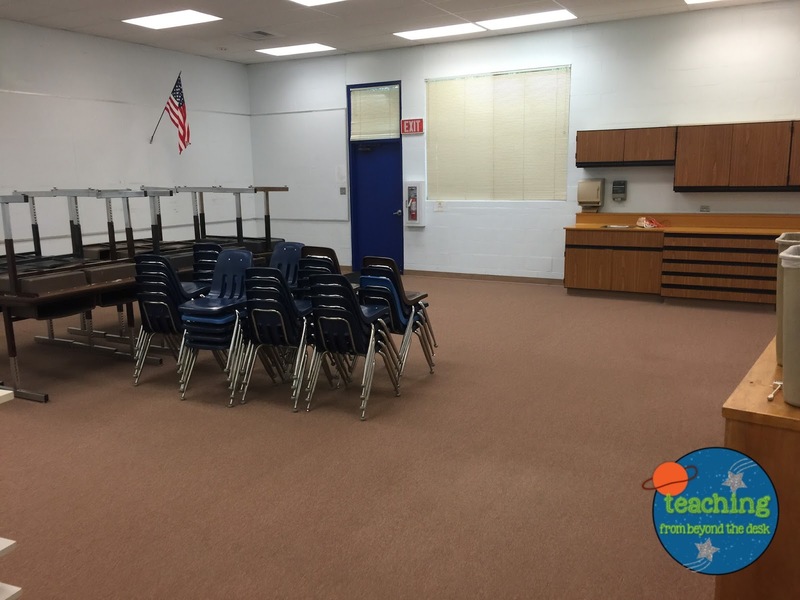 This is extremely early, which made me extremely excited to get planning; however, just as I received my keys, I quickly realized that much of the furniture and major components were not in my classroom. 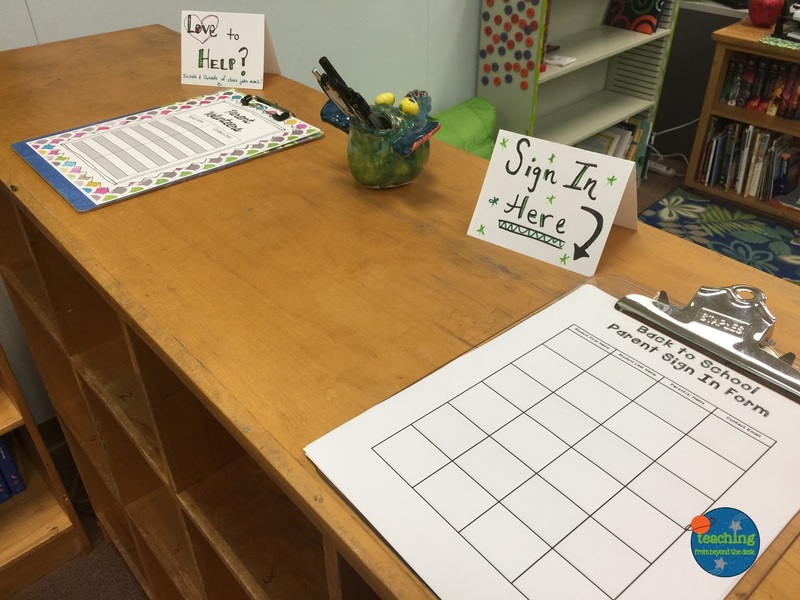 While I could start coming up with lists about basic plans, much of the actual creating could not be finalized until furniture, technology, and classroom numbers were set. Despite my disaster of a bun and lack of makeup, I had to take an obligatory selfie upon receiving my keys. I was excited to enter my room (which was the former library) and see the blank canvas I was working with. Ironically, I was working in room 17 yet again which seems to be my lucky number--my first classroom, my wedding anniversary, and now this classroom. My nearly empty, blank slate. Despite the bare walls, I knew the classroom had a lot of potential. When I walked into my new room, I was overwhelmed. For the second straight year, I was starting with essentially nothing. No goodies to dig through or sort. Just bare walls, no furniture, and lots of possibilities. 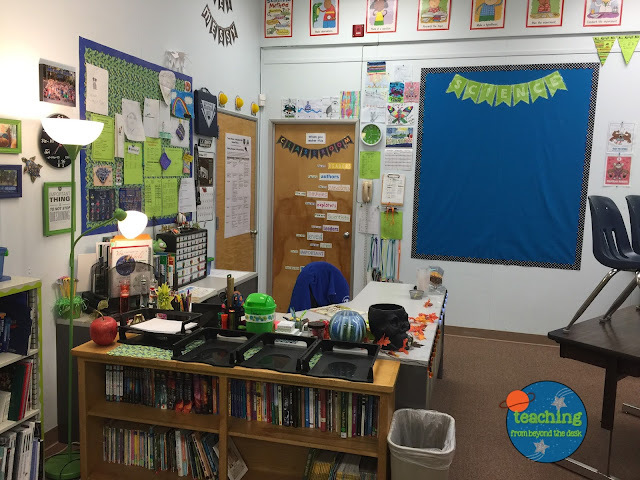 It is safe to say that I started with nothing and have made my classroom my own. Lots of space. As you can see, there was one bookshelf, one technology table, the student desks, two trash cans, and the cabinets in my room. 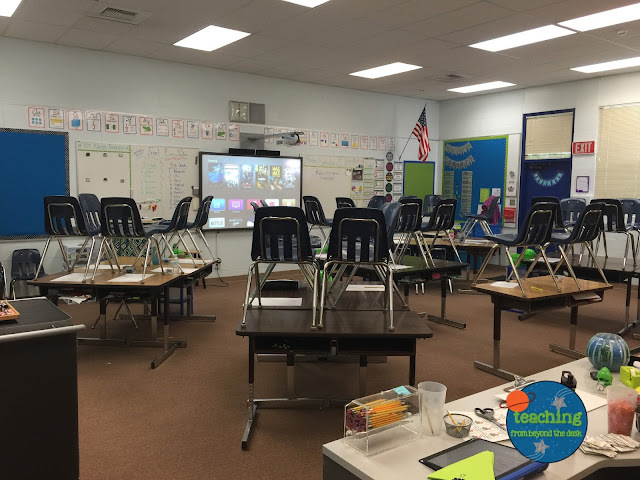 While there were promises about technology, a smart board, and other pieces of furniture, there was nothing placed in my room for the entire month of July. 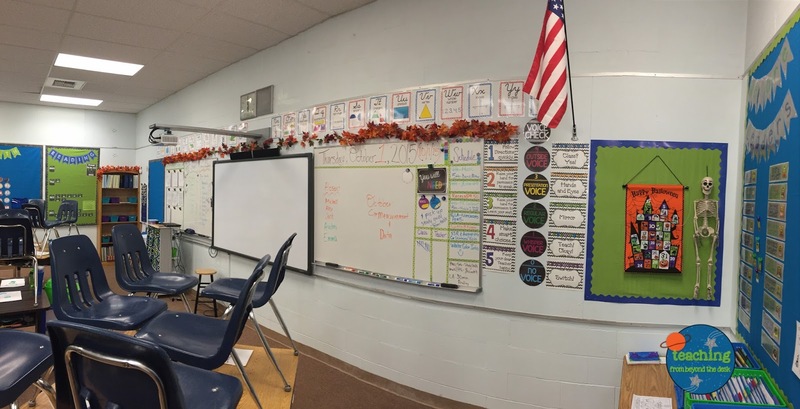 The furniture I brought into the room was mine, and many of the details and things on the walls could not be placed until whiteboards and smart board were mounted on the walls. The organizer in me was panicking, but now that my room is nearly together, it was all worth it. 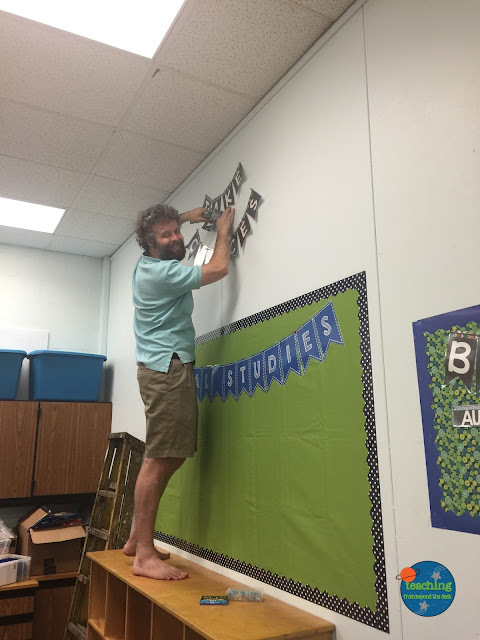 As I started to work on my classroom, I was fortunate to have such a supportive family. 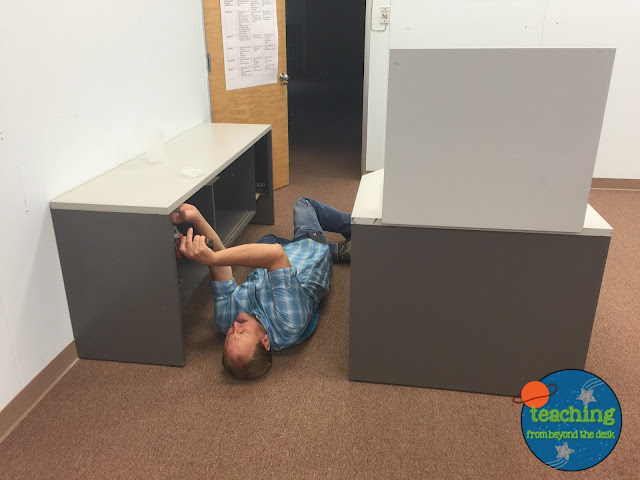 Not only did my dad help me set up my first classroom (including supplying me with this desk), he helped me relocate it to my new classroom. Aren't dedicated family members a blessing? I know that I wouldn't have gotten my room set up in time if not for family support! After getting my desk in my room, it finally started to feel like my classroom. Now, if you look closely on the walls, you can see a whole bunch of holes. Do you see them? These holes were something that drove me crazy. If you are anything like me, I like to have my room look put together, clean, and welcoming. These holes were NOT part of this image. My classroom was the former library. Only days before I received my keys, there were bookshelves mounted everywhere--hence the holes. I knew that my furniture placement needed to be creative, or maybe I would have to find creative artwork. On the counter, there are several boxes. This, my friends, is something that made me squeal out loud (see the next picture). 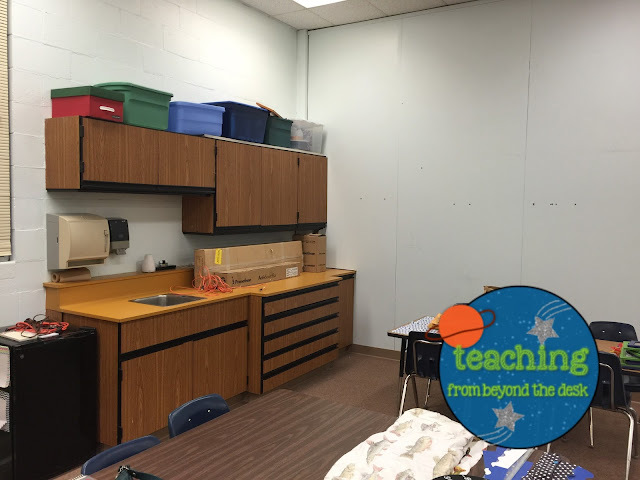 Those boxes were my new Promethean board! This beauty was fresh-out-of-the-box and all mine. Best yet, it got mounted on the wall fairly quickly. Following all the excitement of my new Promethean Board, I was inspired to get work done in my classroom. 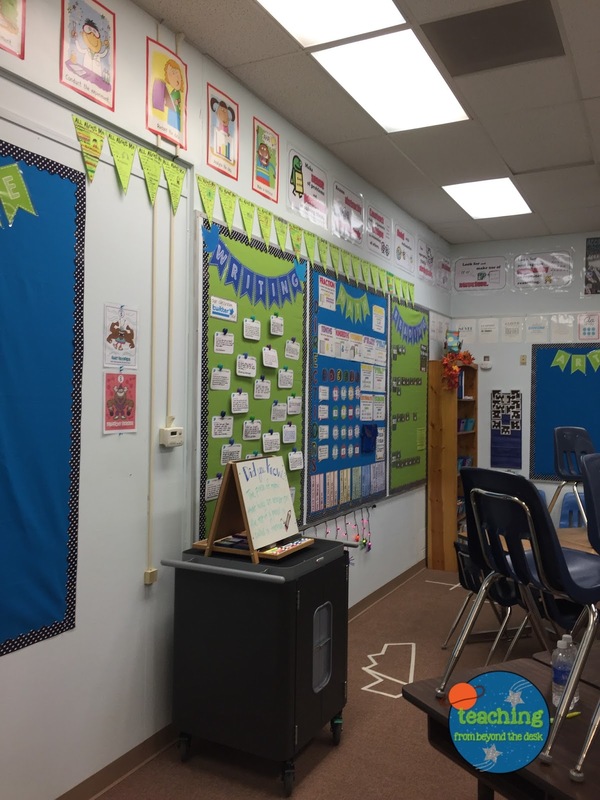 I was thankful that I had bulletin board surface on a lot of walls. Can you sense the pure exhaustion on my face? 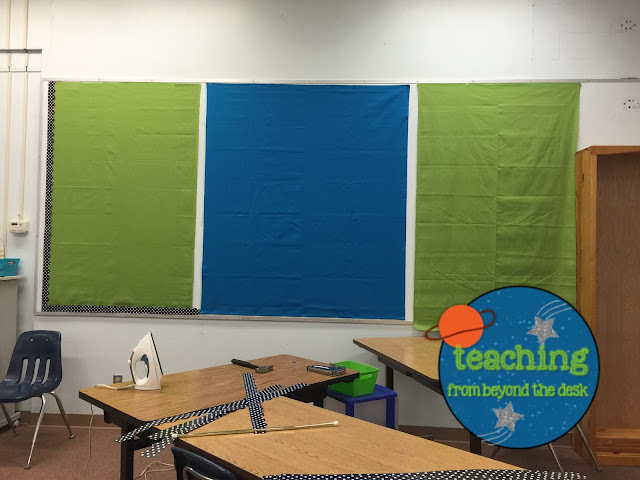 If you have never put fabric on bulletin boards by yourself, it is a lot of work. I applaud all you teachers that change the backgrounds of your bulletin boards. I really do not know how you do it. Really, I want to know your secrets. These boards will stay up here all year. I cannot begin to even think about changing them. My arms and back just ache thinking about that process again. All that work and my room still looked empty. Do you notice all the empty wall space and the lack of furniture? These will not arrive until right before and during the first month of school. Has anyone else had that happen? I was in full teacher panic. This was AUGUST and my room still looked like a blank slate. My amazing husband hard at work again! This is my husband. I would like to have a quick moment of praise for those wonderful teacher husbands (and wives) out there. Really, they are the best!!! I do not know how they put up with all the teacher craziness, but I can personally say that my husband is amazing. Not only does he not mind coming into my room in the summer, late at night, on the weekends, or right before the bell rings because I forgot something, but he jumps in and helps. He has a great attitude, helps me plan, and is just a rockstar. What would we do without those people that help support us? 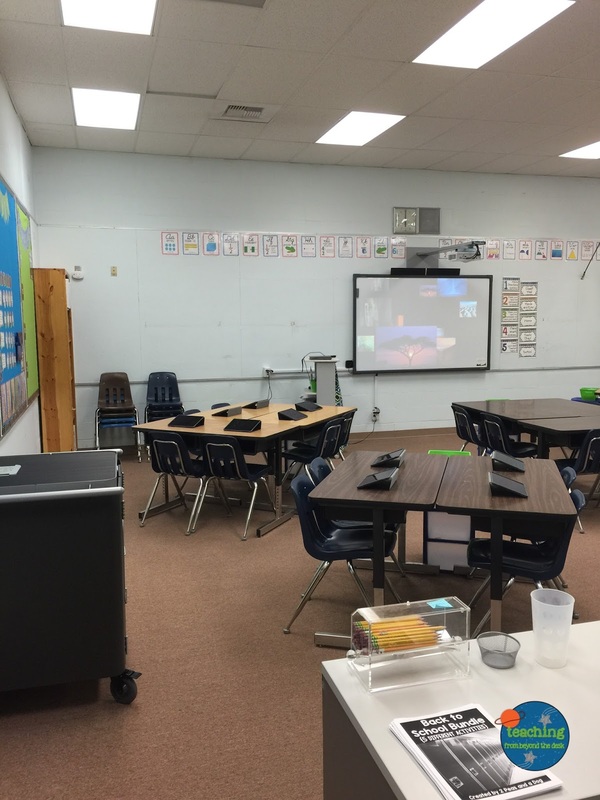 This is what my room looked like right before my first official event at my new school. Do you notice what is missing? Yep--I had no white boards. They were on order, and I was still not certain their dimensions. This resulted in an empty wall. This was really my nightmare. I wanted my room to be finished, yet an entire wall was virtually untouched. I kept looking at all those amazing classroom reveals, and honestly there were tears of panic. Here I was minutes before parents flooding my room for the first time and I really could not finish this wall. There was this blank wall at the front of my room. 10 minutes until the start of Back to School Night. I push-pinned a few posters, my rules, and crossed my fingers that no one would notice my empty wall. I comically placed a piece of paper with a "whiteboards downloading" sign. I got quite a few chuckles with that one. The great news is that my parents commented about the effort I put into making my room a welcoming space. There was not much time to focus on my blank wall. I was also happy to make use of my pen holder that I made with my students last year. I used Google Forms to collect more parent information during my presentation. I am thinking that I might use Kahoot for an interactive component next year! I adore this poem that I picked up here. It matches my space theme that I like to play up A LOT due to my last name (DeMARS). My teacher desk. It seems huge, but I rarely sit here alone during the day. 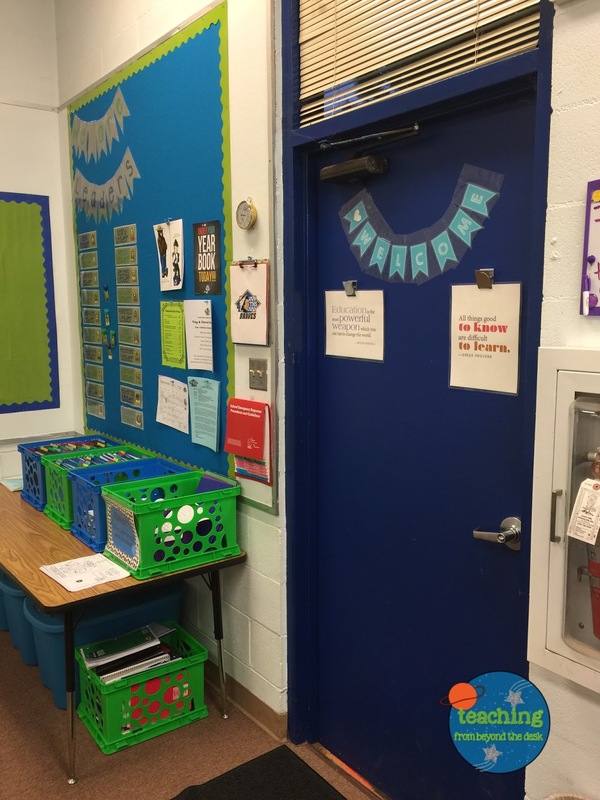 Students use this space for conferencing, it is an area for materials storage (I do not have much storage), and our student-run classroom store is housed here every day. 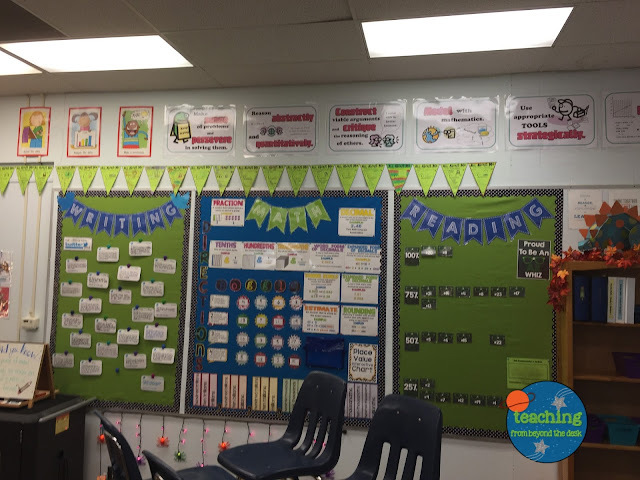 One of my favorite features of my room are the lovely banners made by dear friend, Sarah, from Tales of Teaching with Tech. She made this special banner for me that matches the lovely ones you can see throughout my room here. They come in many colors, are bright, and easy to read. Seriously, go pick them up! This year I tried to add a few personal touches that make me smile. 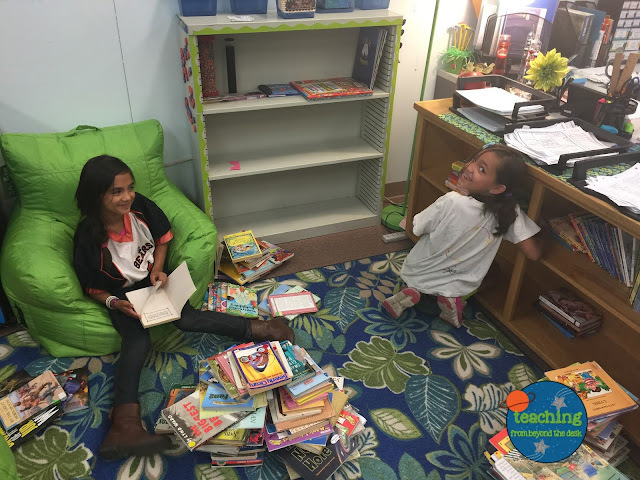 Our classrooms are like our second home, right? 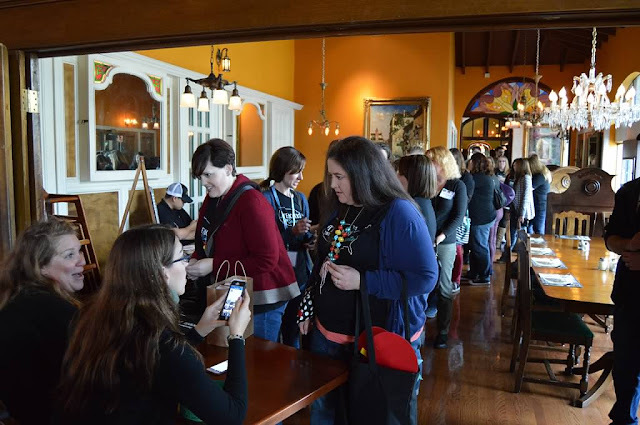 I added the photos from the 2015 Vegas Meet UP with my favorite ladies. These pictures always bring a smile to my face. I love that we were able to spend so much time together. The best part is that we are working to really tackle this teaching adventure together, and this picture works as an anchor to remind me of that. 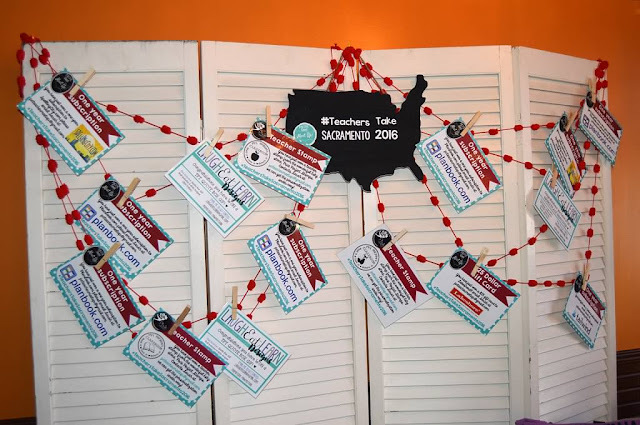 Teachers need to stick together. More details. They really do make all the difference! Seriously, what teacher cannot use a little more help. Nearly a month into school I still had not stamped and organized my classroom library. Two of my wonderful students stayed after school for many hours. They organized, labeled, and entered all our books into our digital library. Priceless, right?! 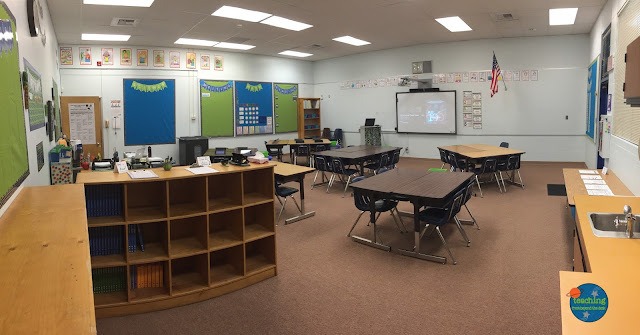 After hours of work, several dum-dums paid out, and lots of laughs, the library was finally ready for my students. I literally started jumping up and down when I realized that my whiteboards finally arrived. September 24th, a day I will continue to celebrate. 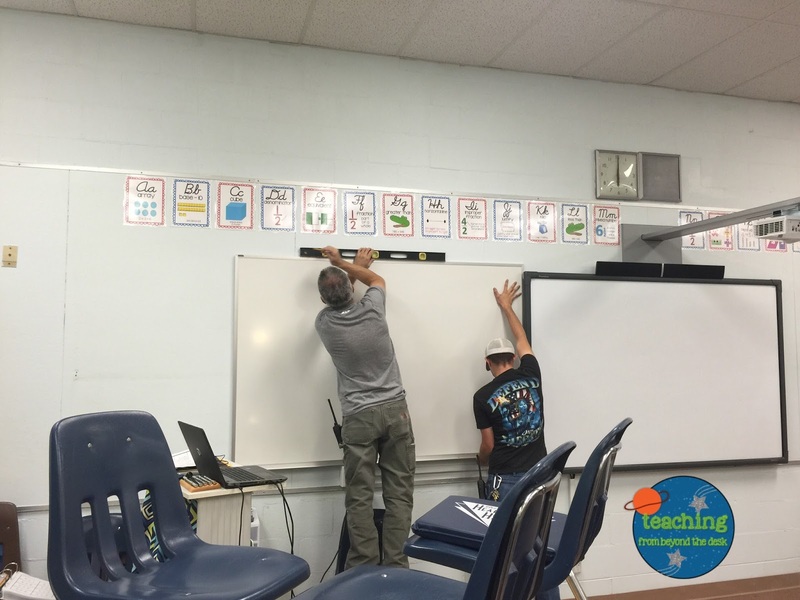 The amazing maintenance staff came in and quickly started mounting the boards. This made my teacher heart sing. As they quickly worked to get the boards mounted while students poured in (the day was just starting), my students started cheering. I think they were almost as excited as I was. 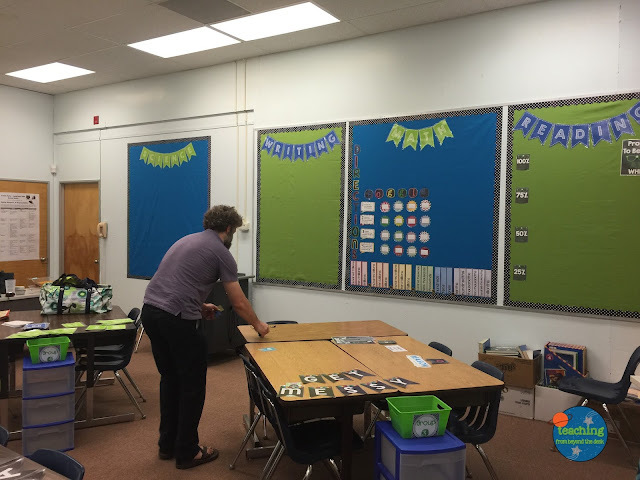 While my students got started on their bell work, I instantly started working on setting up our boards. 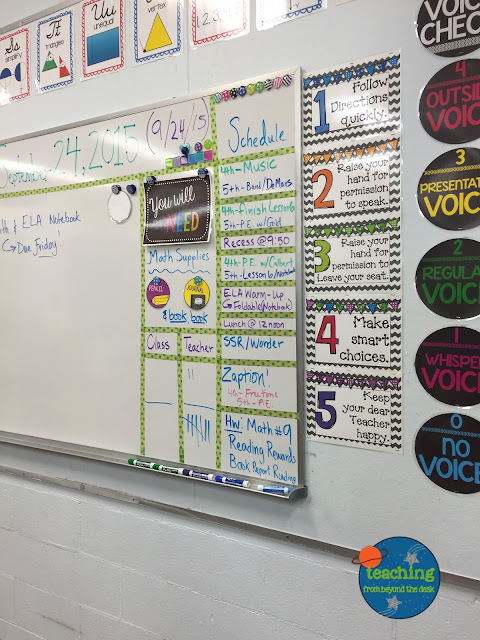 Things were stapled around the board, washi tape placed, our schedule written down. Honestly, it was up in less than 10 minutes. I cannot believe how quickly it went up. Is there a project you complete that just flew by because you were so excited? My students were impressed, and I was elated to have this large piece of my room finally completed. This is closer to what my room looks now. We use the front bulletin boards to celebrate our art, student progress, and other feature events/activities at school. Another look at our classroom door & more fabulous banners by Sarah! We even decorate and focus on seasonal changes. I use brochures and pamphlets to help students synthesize learning throughout the year. They love to display their learning in our brochure holders. Our more organized classroom library. We have been collecting more books through our Scholastic points. Do you have suggestions on how to gain more points every month? I'm all ears! This would be our "final large project" according to my husband. We have a classroom pet. His name is Prism, and he is a veiled chameleon. My favorite wall in the classroom, our iPad cart, and our "Did you Know?" board. Our focus and goal boards. Our interactive math bulletin board. 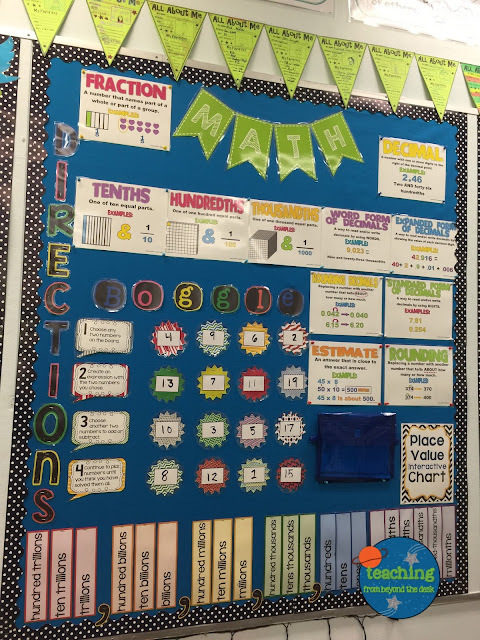 If you have not checked out Jameson's (Lessons with Coffee) interactive math boards, go check them out now. I have purchased ALL of them. I adore them. My kids love them. It is worth it. They gravitate this boggle wall during 'free time' and they are quick to remind me if they need more forms. I started changing our board and they begged for another week with math boggle, and of course they obliged. Well, thank you for touring my classroom. I am thrilled that it looks more complete and is closer to the image that I had in my head so many months ago. As the school year continues, I know that it will continue to evolve and change, but for now it definitely feels like home. How do you make your classroom feel like home? 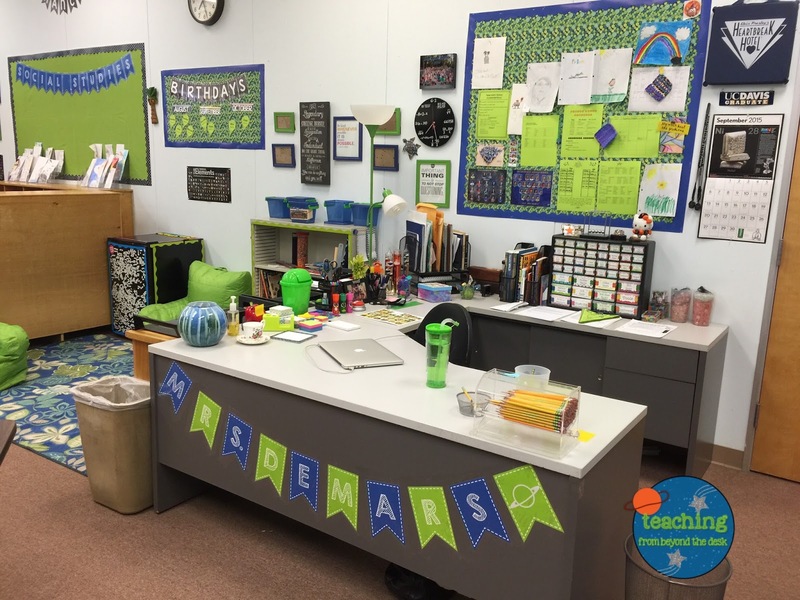 What is your favorite element of your classroom? Happy Learning! 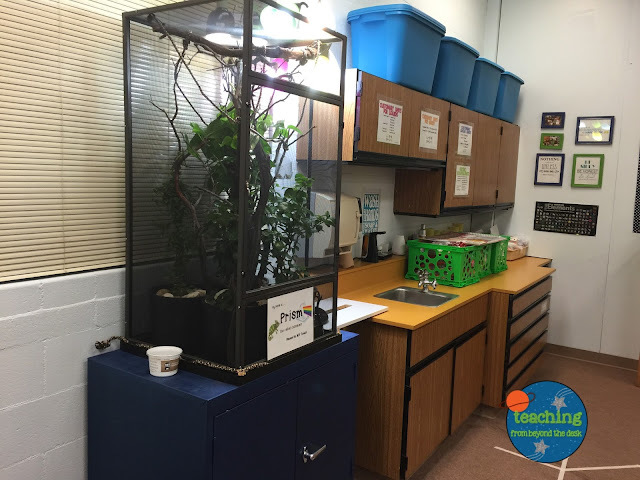 Stay tuned for a post about pets in the classroom!